I enjoy the nice, shiny, well-preserved cars in this series, of course, but I really love me some beaters! Cars that haven't been coddled for one minute of their decades-long lives! This Cyclone is one of my all-time favorite Alameda cars; an original 289/4-speed machine, it's been roaring around the island for at least the last 15 years and probably longer. It sounds good, looks mean, and lives on a busy street. Sure, it's slowly rusting away, but it's got decades to go before the slow-motion California-style rust finally brings it down. I've talked to the owner of this car a few times (we were neighbors for a couple years in the late 1990s) and he's extremely proud of his wheels. As I recall, he's either the original owner or the second owner, and he has plans to get the body and paint done... someday. There's some rust-through on the hood, but you figure it took 44 years to get this bad... plenty of time to fix the body! The Cyclone name was later applied to a separate Mercury model (the Merc version of the Fairlane/Torino), but in '64 it was the high-performance package for Mercury's Falcon clone. 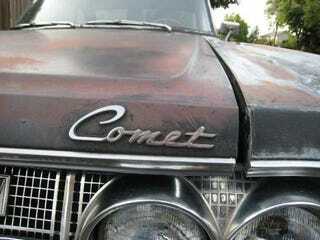 You got the 210-horse 289, some racy-looking emblems, and bucket seats when you opted for the '64 Comet Cyclone. I'm puzzled by this car's vanity plate. There was a slot-car shop in town for a while, so perhaps the Cyclone's owner was the owner.